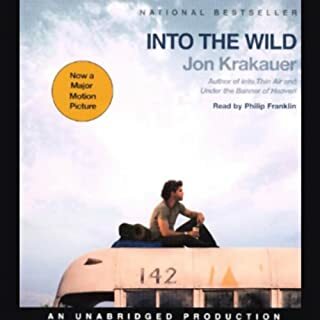 ©1997 Jon Krakauer (P)1997 Bantam Doubleday Dell Audio Publishing, Bantam Doubleday Dell Audio Publishing, A Division of Random House Inc. 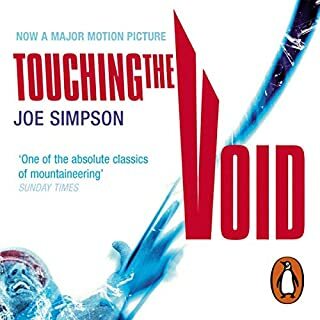 This is easily one of my favorite books of all time - especially the audio version. Originally, Mr. Krakauer narrated the book which made it even better because he was emotionally attached to the story since he lived it. His narration was masterful, to say the least. 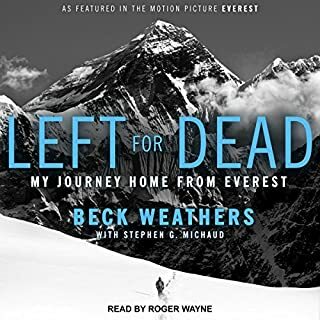 I had purchased this book a couple of years ago and had listened to it twice, but after seeing the movie Everest recently, I decided to listen to it again. Since I had recently purchased a new phone, I had to re-download the book and to my horror - there is a new narrator! While he does a fine job, it is no where near the caliber of Mr Krakauer's work. I was told this was the decision of the publisher. Thanks a lot guys, you have completely ruined the audio version of this book!!! I'm not sure what I expected with this one -- I wasn't aware of this particular disastrous climb before, although I certainly do remember various magazine spreads showing people doing silly things like climbing to 29,000 feet -- not when passenger airplanes normally cruises at about 30,000 feet. You mean as you're flying along, someone could be outside your window, there, looking in? Well, maybe not. Not without some conditioning, but still.... Why would someone do something like that? I still don't know. It sounds not just highly likely to be lethal, but it's also not all that pretty -- the way the base camps are described -- dirty, cluttered, thin air, poor food, people sick, barfing, gasping, wounded, struggling to survive -- don't come across as pleasant at all. But what I do know now, with more intensity than I ever expected, the vast array of really dreadful things that can happen to you when you do. I surely didn't realize all the things that went into such a climb -- the high-altitude conditioning, the high cost (although I guess I could have figured that out) or the surprisingly large number of regular ordinary people, more or less, who decide that a climb to the top of Mt. Everest belongs on their bucket list -- sometimes the last entry, apparently. All I can say is this: This is a heck of a book. I will most definitely listen to this one again -- maybe many times over. I was so hooked on listening that the rug I was crocheting at the time had to be completely ripped up and started over. Sometimes I'd just stop dead, and sit and listen. Few books in any genre beat this one for its "so what happened then?" quality. Listening, the only thing you know for sure is that the author survived, so that he could write the book. Anyway, this is a really really good book. Don't miss it. Jon Krakauer, eyewitness, author, and narrator, grabs the audience in a way which transports them with the doomed 1996 Everest expedition teams. We feel the camaraderie, exultations, and eventual tragedy while safely well below the "death zone". Having skimmed the printed edition, I finally purchased and listened to this title while commuting - for the first time I wished my commute were longer or the traffic worse! Jon reads with feeling, as he should; he was there and witnessed the events. His account is gripping and the unabridged version is well worth the additional investment of time! 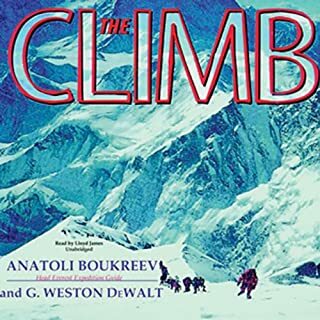 I see that The Climb by Anatoli Boukreev, a guide on Fisher's team, is also available on Audible - to better understand the events of mid-May 1996 one would want to listen to both titles. Having been an Audible listener for over 2 years, I have often relied upon reviews of other listeners when choosing new titles; this is my first contribution. 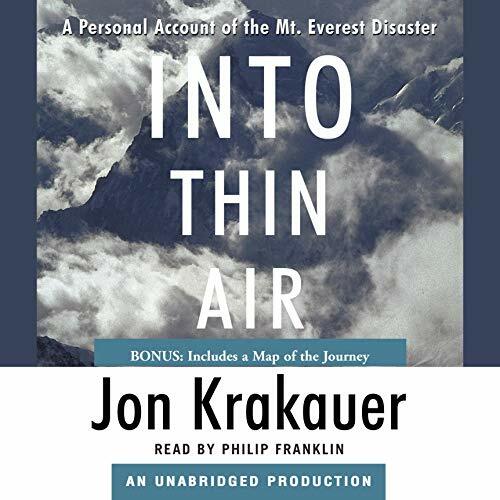 Into Thin Air is the dramatic retelling of the Mount Everest disaster as told by an Outside Magazine writer that was on the expedition. I am normally not fond of author's reading their own books--this seems to be a job better left to professional readers. In this case, having the author read the book adds extra weight to the tragidy of the story. I've been an Audible subscriber for two years and this has been my favorite book so far. This was a great, thrilling story and well read by the author. The sense of "being there" with John on Everest was palpable. As a reader, I am normally overly eager to reach the end of a story, to see how it turns out, and get on to the next read. This was a book I never wanted to end. It kept my attention rivieted every second. My most enjoyable book for the last year! Where do I start? This book has changed people's lives for years and it changed mine. The detailed account of how people strive so hard to achieve an almost unreachable goal despite the fact that they might die is almost unbelievable. 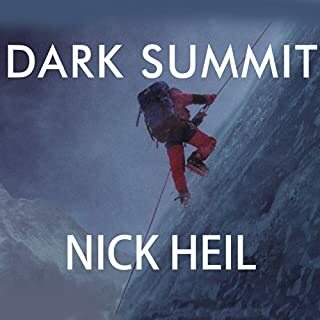 I do not understand why climbers would put themselves through the suffering one must endure to stand atop Everest, nor do I have the desire to climb Everest, but I found this book completely enthralling. It is a testament to the human spirit and what man can and will do once he/she has set their mind to it. I ended the book, listened to the interview, and immediately started the book over again. It was that good. I highly recommend it to anyone looking for a good non-fiction read. This book actually made me greive as though I were somehow part of the story. Amazing when an author can actually make our theoretical connection to others become very real. It's quite a masterpiece and one of the best author readings I've heard. For us couch potatoes who drive to the corner grocery store, this book shows you how far some people will take themselves "just because it's there". Excellent all around: prose, plot, narrative, reader. This is the first Everest Saga that I have read. It has left me wanting to find more to read and listen to. When I had finished I was sure that I had heard an honest description of what had happened. It is interesting to follow the stories of others who were mentioned, try to change what happened to releive themselves of any feelings of responsibility. A story so compelling it pushes other engagements out of the way. The depth of vivid description grabs as intently as the lethal danger surrounding the climbers. 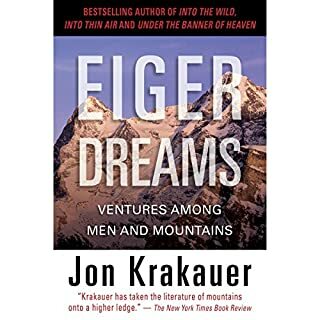 Krakauer is the best writer I've yet to come across in my stint on Audible. His work rival's Diana Gabaldon's incredible delineations. The effortless flow of dense, diverse description of an eclectic cast of driven individuals struggling against the very edge of life completely ensnares the listener.